The toaster has extra wide 28mm slots which are prefect if you fancy a toasted sandwich and need to use the sandwich cage. It also has an award winning ProHeat element which will help to efficiency toast bread, muffins or crumpets, It also features a removable crumb tray and an adjustable rear foot. 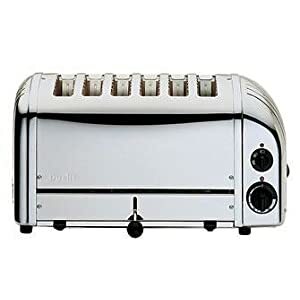 The toaster also features switches to control the degree of browning so you can enjoy your toast exactly the way you like it. The ejector system ensures your toast does not pop up but stays warm until required. You can set it to toast 2, 4 or 6 slices and you can lever the toast up to check how brown it is without switching off the heat. The Dualit 6 Slice Toaster is quite expensive for a toaster but It's worth every penny.